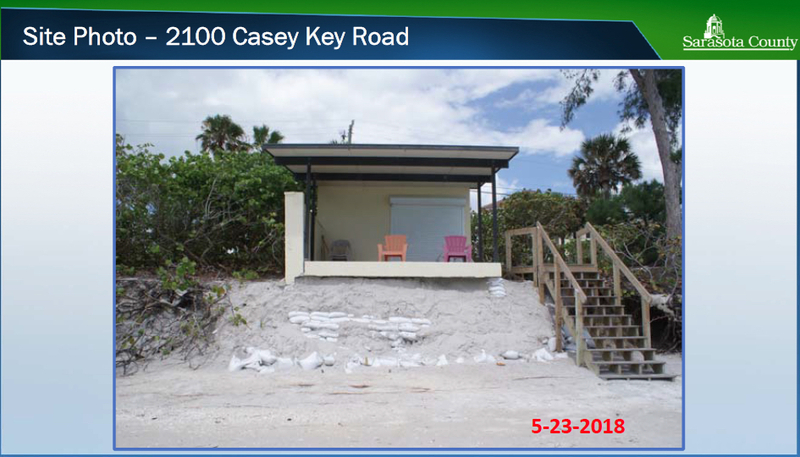 It took just under 24 minutes on June 12 for the Sarasota County Commission to grant a Class II Emergency Variance to a Casey Key couple so they could stabilize a cabana at risk of becoming debris on the shoreline. Howard Berna, the county’s environmental permitting manager, told the board members that the petition was only the third for such a variance that staff ever had brought before the County Commission for approval. Commissioner Charles Hines noted at the conclusion of the public hearing that the couple — David and Sara Evans — were able to get a county variance for sandbags first through an administrative process. Then staff was able to schedule David Evans’ appearance on the petition for the Class II variance when the determination was made that needed to be the next step. Therefore, it appeared to him, Hines said, based on the dates in the materials staff had provided the board, that the process had flowed fairly quickly. Berna pointed out that the county’s Coastal Setback Ordinance — originally adopted in 1979 — allows the commissioners to grant a Class II Emergency Variance as a temporary measure to protect shoreline property. 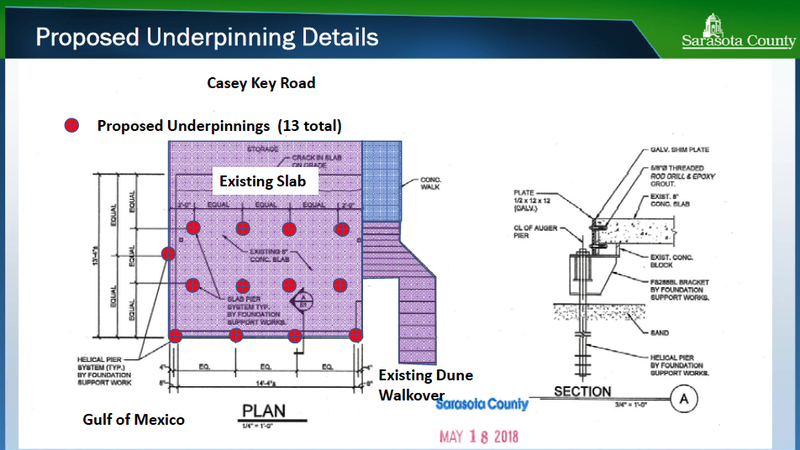 In this case, Berna explained, erosion, “exacerbated by a fairly strong cold front that occurred late in March,” damaged the cabana on the Gulf of Mexico side of the property at 2100 Casey Key Road. That cold front caused more than 10 feet of dune erosion, Berna wrote in a June 12 memo to the board. “Waves washed out most of the sand underneath the concrete deck of the … cabana structure, exposing a slab foundation,” he added in the memo. The cabana dates to the 1970s, the memo said; it is completely seaward of the county’s Gulf Beach Setback Line (GBSL). The latter is the figurative “line in the sand” established to preserve dunes and vegetation and thereby protect landward property from serious storm damage. At times, he said, the wind speed at his Casey Key home was in excess of 30 mph. Berna noted that the Evanses had applied for a Class I Emergency Variance to install sandbags on their property; that was granted on April 2, according to Berna’s memo. If the underpinnings are in place and further damage ensues, Berna pointed out, staff would require the removal of the structure. The stabilization project, he continued, would “not interfere with access along the beach”; nor would it involve the destruction of vegetation. If he is unable to have the underpinnings installed, Evans added, the result could be “a debris field on the beach” if another storm occurs. Four of his neighbors had offered their support for the project, he said. No member of the public addressed the board. After Detert closed the public hearing, Commissioner Alan Maio made the motion to approve the variance; Commissioner Hines seconded it. Commissioner Michael Moran was absent because of a death in his family, so the vote was 4-0.